Apparently baffled, the RT host questioned Al-‘Inzi about his claim, to which he explained that these states belong to the Saudi state, which in fact stretches from Yemen to Iraq. The Syrian guest snapped back at al-‘Inzi that Syria boasted a civilization that stretches back 10,000 years, this while Saudi rulers only recently use to sleep in tents in the Arabian desert. 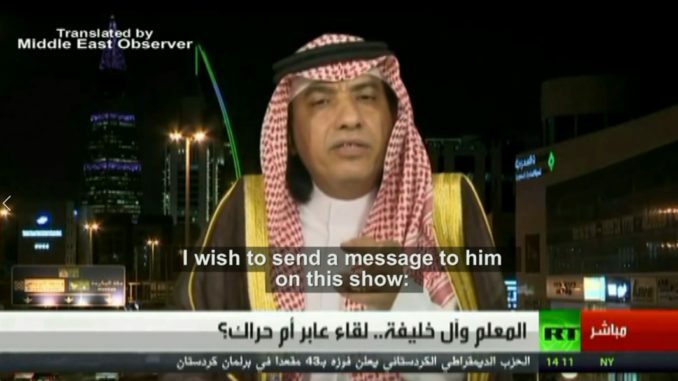 – Saudi guest: First of all this gentleman talking from Damascus, he speaks about us in the Arabian Peninsula and Saudi Arabia as if we have nothing to do with this arena, or that we’re unable to do anything in the Syrian arena, or the Iraqi arena, as he brags about the Iranian regime. I wish to send a message to him on this show: my friend Syrian and Iraqi lands are our horse ranches, these lands are ranches for our horses, who are you to speak about Syria? We in Saudi Arabia only wish to avoid further bloodshed for the Syrian people, (but) we are able to topple the Syrian regime and the Iraqi regime, and we are able to support the Syrian people and we did so, Saudi Arabia has been supporting Syria throughout past years, however, today there is one million people displaced, and more than 300,000 dead due to fighting in Syria. We care about Syria, we wish for there to be peace, we don’t care who governs Syria, whether Bashar al-Assad or this person or that, yet for you to think that we have no interests in Syria, or that we have no power in Syria, these are our horse ranches, from Hejaz to Baghdad, from Hejaz to Damascus, you and your likes were placed in power by the French and American governments, the treacherous collaborators you are. These are our horse ranches, these are our lands. – Host: I ask you to avoid (personal) attacks Mr Dahham, to avoid getting personal so that we can keep it as a political discussion. – Syrian guest: this is the epitome of insolence Ms Maysa…notice this goat how it speaks! – Host: Please, I think Mr Dahham had a slip of tongue and this wont be repeated. Go ahead Mr Dahham. – Saudi guest: I am telling the gentleman that we care about the Syrian people. We don’t care much about who governs Syria. He thinks that Saudi Arabia wishes to install a president for Syria. No this is not our goal. Our goal is that there be peace and harmony in Syria, and our goal is to remove the Persian enemy (from Syria). There is a Persian-Iranian project in Syria right now, doing what it wants, carrying out the worst types of ethnic cleansing and demographic shifts in Syria…and this guest of yours thinks that Saudi Arabia has no interests and no right to intervene in Syria, my friend these are our horse ranches, from here to Baghdad and from here to Syria, (all) these states belong to the Kingdom of Saudi Arabia, whether the Gulf Sheikhdoms, or Iraq or Syria, they belong to the Saudi state, from (Yemen’s) Sana’a to (Iraq’s) Baghdad. – Host: Sorry I don’t understand what you mean by ‘these states belong to the Kingdom of Saudi Arabia’? – Saudi guest: this guy who lives in Syria must understand that these states, Syria, Lebanon, and Iraq, and even many of the Gulf States, these belong to the Saudi state, which stretches from (Yemen’s) Hudaydah to (Iraq’s) Baghdad, I mean Karbala. – Host: How do they belong (to Saudi Arabia) Mr Dahham, we are talking about sovereign states? I don’t understand what you mean by this exactly…this is a huge historical fallacy. – Syria guest: These guys are really laughable! – Host: let me give Dr Alaa a chance to reply, then I want to move to other issues. Dr Alaa please go ahead. – Syrian guest: honestly this guest is laughable and ridiculous. ‘Your horse ranches’? We will break your legs and your horse ranches! Leave your horse ranches in the desert! 70 years ago you use to sleep in the desert and tents, and you would place your camels in your villas and palaces to sleep, enough nonsense! Syria has 10,000 years of civilization! Enough stupidity, and your oil and dollars will never have any value.